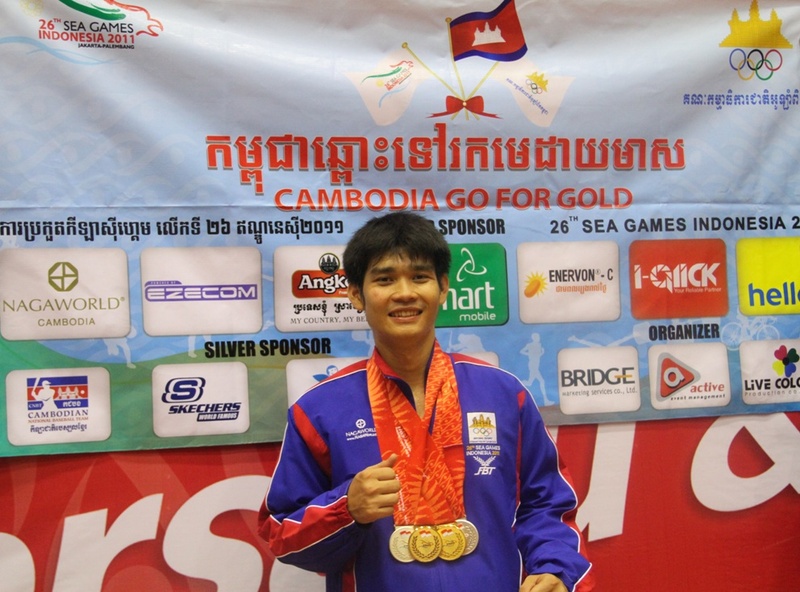 Cambodia's Gold haul hit Three to equal the number of Gold won in the 2009 SEA games to Increase the Kingdom's medal Tally on the 6th day of competition following brilliant performance by the Vovinam Athletes winning one gold, 2 silver and 1 bronze on Wednesday at the SUNTER SPORT CENTER, Jakarta. The Quartet of fighter Ly Boramy, Prak Vanny, San Socheat and Pal Chhoraksmy won the Gold scoring 276 points to beat Vietnam and Indonesia in the Women's Multi Weapon - Mixed to add to the Gold won by My Boramy earlier on Monday. The Pair of Ly Boramy and Pal Chhoraksmy narrowly missed Gold when they could on garner 275 points behind Vietnam 281 point in the Women's defense Mixed. They settled for Silver along with Indonesia with equal points. In the other events of the day, Chin Piseth and Chrin Bunlong won Silver in the Men's Weapon Double while Vy Srey khouch had to give up in the middle of the female 55kg female after sustaining a dislocated shoulder in the semi finals against Lao's CHANTHANIVONG VONG who went on to win the Gold. On Tuesday, the petanque men’s doubles pair of Or Chan Daren and Yim Sophorn struck Cambodia’s second gold at the 26th SEA Games as a clutch of silver medals and two bronze varieties kept the Kingdom’s contingent buoyant. The Cambodian duo had to put in their best in the final at the courts of Palembang’s Jakabaring Sport Complex which produced a nail biting finish that saw Or Chan Daren and Yim Sophorn keep their nerves to down Vietnamese players Huynh Cong Tam and Nguyen Van Dung 13-12. On the contrary the Kingdom experienced a disappointing display in the final by Cambodia’s women’s doubles pairing of Duong Dina and Oum Chantrea who went out without a trace 13-0 against Thailand’s Thongsri Thamakord and Phantipha Wongchuv. However, having come out of a tough semifinal against Vietnam’s Vu Thi Thu and Nguyen Thi Trang 13-11, The Cambodians were more than happy to pick up a silver medal. This additions from Vovinam helped Cambodia Medal haul to rise to 23 on Wednesday despite the near misses of golds in Jakarta on Tuesday. Current ASEAN champion in her class Sorn Davin could not hold her own against Ha Thi Nguyen of Vietnam in the final and had to settle for a silver medal and a dislocated finger, the first silver for the Kingdom in taekwondo on the top of three bronzes so far. On the way to the final, Sorn Davin Dispatched with ease her opponent from Indonesia Katur Yuni Riyanin in the semis. Meanwhile Sorn Darvin's Injury to her Wrist has ruled her out of the Asian Olympic Qualifiers which is due to hold later this month following the postponement due to Flood in Thailand from the Initial Nov 2-6th Date. Sorn Darvin throws a kick at her Indonesian Opponent in the Semi finals On Tuesday.